The Hero Honda is all set to launch the new Hero Honda Karizma. 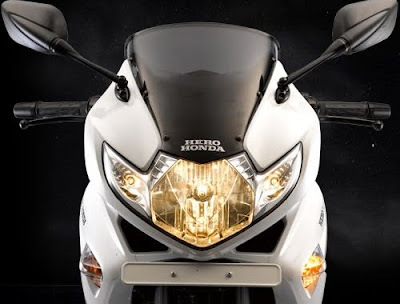 The bike promises to be one of the best releases of Hero Honda. The bike has superb features along with stunning looks. Karizma gives a strong and healthy competition to the bikes of its class like Pulsar 220 and Yamaha R15. The new Karizma has been fitted with a strong and heavy engine of 225. The engine is again 4 stroke type and has single cylinder, OHC and air cooled type engine. Karizma comes with 12 hole fuel injection which help to generate maximum power in less time. Thus the engine has a strong impact and impressive technology. The engine of new Hero Honda Karizma generates a maximum power of 17.6 bhp@7000rpm and maximum torque of 18.35 Nm@6000rpm.The bike is made set to run on all types of roads and hence is equipped with a new technology which scans engine to control air pressure, air temperature and engine temperature to provide better performance on all types of roads. The company has done a lot of works on the looks of the bike to make its appearance impressive and attractive. The Karizma comes with LED lights placed inside the headlamp and tail end light. A digital round shaped tachometer adds to the looks of the bike.Also properly placed digital display add more style to the bike, Speedometer, front and rear disc brakes, fuel indicator, trip meter and clock are also well placed. All these thing give a good finish to the bike. 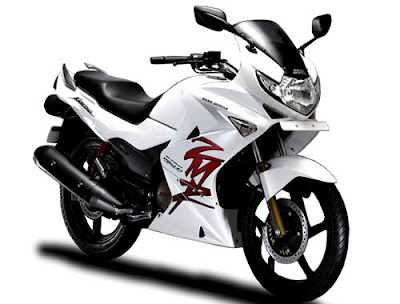 Hero Honda Karizma ZMR produces a top speed of 126kmph. It reached 0-6 km in 3.6seconds. Sounds really cool and impressive. With Karizma, you can expect a mileage of 40-50kmpl. You can find the Hero Honda Karizma ZMR in 5 different colours like sports red, panther black, moon yellow, pearl white and vibrant blue. The bike is available in self start. Both the brakes of the bike are disc type. The front brake is 276mm and the rear brake is 240mm.The bike is petrol type and fuel capacity of the bike is 16 litres.The area of bike is 2110X805X1175mm.The wheel base is 1350mm which is really very wide and hence adds to the looks of the bike. The cost of the bike may start from Rs.91000 and it may vary area wise. The bike is made eye catching and its features also make it precious. The bike has been made keeping the views and responses of people. The ZMR is ready to hit the market with its new and improved features and also is going to be a great competitor to the other bikes of its class.